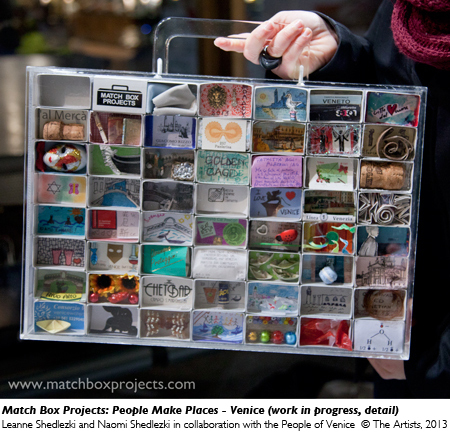 delivering us your matchbox contribution to our portrait of your city. We are currently creating People Make Places, a project which brings people together to consider their own sense of place and celebrate and deepen mutual understanding of diverse rural and urban regions across the globe. To date 3,500 people from Melbourne, Sydney, Shanghai, Deniliquin, Mosman, Venice, London, Berlin, Edinburgh, Dubai, Adelaide, Cannes, Amsterdam, Paris, Lane Cove Brisbane, New York San Francisco and Tokyo are participating. 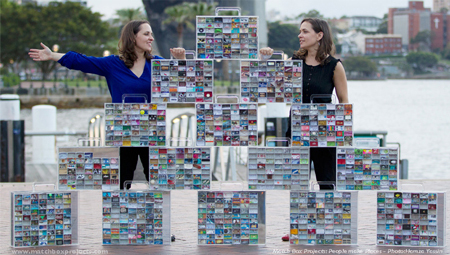 They have created miniature matchbox impressions of what they wish to share with the world about where they live. We are currently in Sydney. 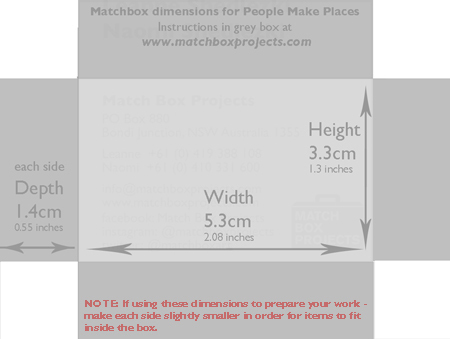 We warmly invite those living/studying and/or working in Sydney to create something responding to your region for one of our Match Box Projects boxes. It can be anything that represents your city, from an image to an object, a piece of writing, something made or something found...as long as it fits inside the box...(and complies with the instructions below to enable us to travel with your creation through international customs). If you live in other regions, we welcome you to join the journey if/when we get to your neighbourhood. Looking forward to seeing you and your city's/town's impression soon. 1. 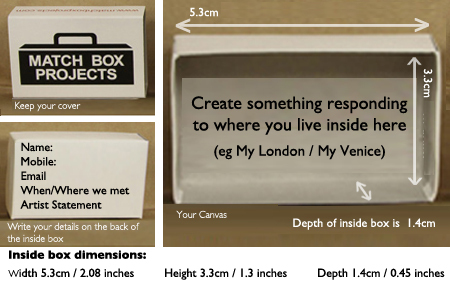 Create something responding to where you live for inside one of our matchboxes. Works created in line with the below will travel with us to introduce your locality through the eyes and hearts of those in your region. • Glue/adhere materials inside the box. Do not include small fragments that tend to become unglued eg no glitter and no sand. • Your work will presented in public spaces, therefore must be be appropriate for all ages to view. When you have finished creating your work, please contact us via e-mail with your name and contact details. We will then invite you to our next Match Box Rendezvous or workshops. NOTE: When meeting us please ensure you have ample time for us to photograph your hands with your box and record your voice (see 4 and 5 below). When delivering your matchbox we will photograph your matchbox in your hands. (see below image examples from Venice Portrait). Please allow ample time to drop your matchbox off, as there maybe others waiting to be photographed too. When you deliver your matchbox we would greatly appreciate it if we could record your voice. This will allow the blind and visually impaired to "see your box" and enable others to gain a further insight into your impression of your city. The recording will include the title of your box, a detailed description of what you have put inside it and why. (There is no minimal time limit - but we prefer your statement to be 30 seconds to 1min30seconds long). 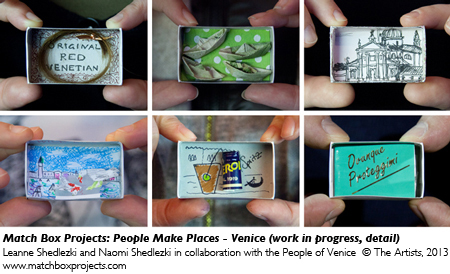 When delivering your matchbox to us, it becomes a permanent contribution to our portrait series as part of People Make Places and you will be automatically assigning copyright of same onto us (Leanne Shedlezki & Naomi Shedlezki aka Match Box Projects). This will allow us to share it with the world and permit us to exhibit, photograph, video, publish and present it in public/private exhibitions, in press, in print, in video/multimedia works/ catalogues, on our website/blog etc. Please keep the cover of the box in a safe place. On completion of our Places Series we will contact you to present you with an exchange/bARTer gift to go inside your original cover. If you have friends/family that would like to take part in our project, please let them know they are welcome to pick up a box when you deliver yours. We are looking forward to receiving your matchbox and seeing you soon.